Located two blocks from the beach with an ocean view is this 3 bedroom three and a half bath home. 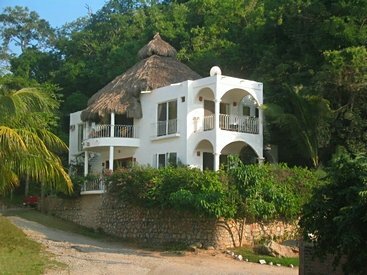 The home is currently a successful bed and breakfast called Casa carousel. The following dialog and pages are taken from the Casa Carousel website. Casa Carousel is located where the sea meets the jungle in a tiny Mexican fishing village, La Manzanilla in the state of Jalisco. Our guests will be served a gourmet breakfast every morning, indoors or outdoors.The amenities we offer are ocean view, color satellite TV, multifunctional DVD player, open terrace for sunset watching, internet service, air conditioning, ceiling fans, an ecological 20 foot waterfall for viewing, hearing, and feeling the cooling affects. All our rooms have private baths. We offer our guests a comfortable and relaxing atmosphere. We are located one and a half blocks from the beach and downtown. Our carousel collection will add to your memories of times passed.We respectfully request adult guests and no pets.Your hosts, a combination of Mexican and American cultures, blending US Southern and Mexican charm and hospitality. nLa Manzanilla offers beach combing, Kayaking, fishing, sightseeing, jungle and lagoon tours nearby or you can choose reading, relaxing, or watch the incredible sunsets.